Offering you a complete choice of products which include single spindle automatic lathe machine. We offer an authentic and reliable range of Single Spindle Automatic Lathe Machine that has made it very popular in the industry. Our Single Spindle Automatic Lathe Machine is highly competent to manufacture components of ferrous as well as non-ferrous materials which are round, hexagonal and of square shape. We make use of high quality raw materials and advanced technology for the manufacturing of our Automatic Single Spindle Lathe Machine. 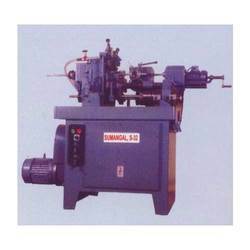 Moreover, owing to the various qualitative features of our machine, we are counted among the most preferred Single Spindle Automatic Lathe Manufacturers, Marketers and Exporters from India. Looking for Automatic Lathe Machine ?